Photo: Human trafficking survivors at our rehabilitation home have learned how to make clothes for our orphans! The shirt she’s wearing is one of the items they’ve learned to make. Creating a cycle of hope. The young women of our human trafficking rehabilitation home, mostly teenage girls, are being equipped with many skills, one of which is seamstress work. It occurred to our Nepal director one day as he was preparing to buy new clothes for the orphans that the girls should spend some of their class time trying to make the clothes. As seen in the photo, they’ve done a great job and the children love the clothing. This is another example of our model of empowerment creating sustainable change for those most in need of hope. 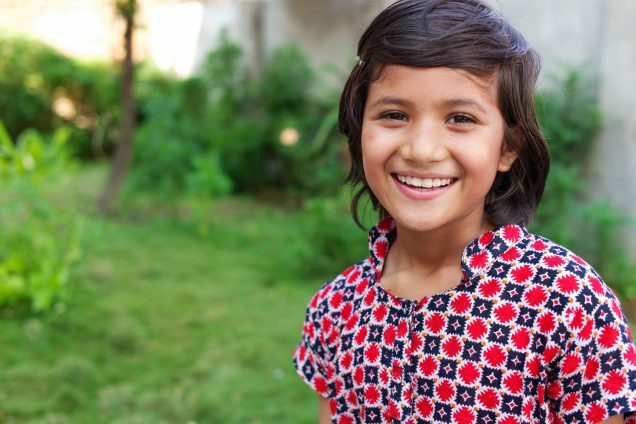 Our rehabilitation program is taking in young women and teenage girls rescued from human trafficking situations in India and other Asian nations. The program gives them hope through counseling, medical care and skill development. So far the program, now in its third year of operation, has graduated over 50 young women, sending them into restored, secure lives with highly marketable and useful skills such as craft and jewelry making, seamstress skills and gardening skills. Our orphanage in Nepal is home to 23 children who have been rescued from child labor or abusive situations in extreme poverty. The programs are sustained in part by our farmland which is comprised of a goat house, potato harvest and various vegetable gardens. The food is grown organically and provides nutritious ingredients for our orphanage home and rehabilitation home meals. Next:Myanmar: A story of sustainability leading to smiles through education!